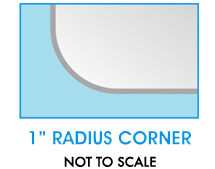 The 44”x84” Rectangle glass top is made from the finest quality of furniture glass. This rectangle glass top comes in two types to decide from. 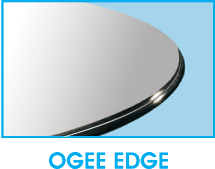 The first, has corners that are 1”radius along with a 1” bevel edge which comes in two different thicknesses 1/2 inches which weighs 200 lbs and ¾ inches weighs 250 lbs, The second,Rectangle Glass top has an ogee edge with 1” radius corners with a thickness of 3/4 inch and weighs 250 lbs The glass table edges and corners are expertly polished for a beautiful and quality look - plus, it's tempered at no additional cost! 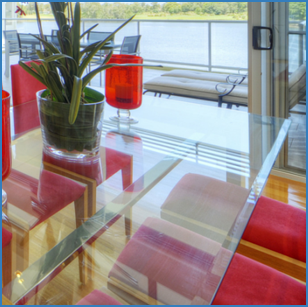 The rectangle glass tops are good for replacement glass or to give any coffee, or dinning table a new look and feel. This piece is large enough to fit 6 people around it. Glass top tables have many different uses hence the reason it is used it several decorating designs. With the different choices it can give any room a new look. Each beautiful rectangle glass top comes with free bumpons that are placed between the glass and the base of the table to protect them. The glass tops are also professionally packed in their own individual cartons with styrofoam to help protect from breakage during shipment. 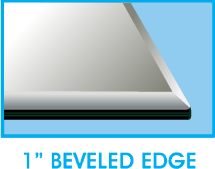 The 44”x 84” rectangle glass top will be sent quickly via FedEx or common carrier and is insured to for a safe arrival.